The following post is a portion of the Leaflet Tips and Tricks book which is free to download. To use this post in context, consider it with the others in this blog or just download the the book as a pdf / epub or mobi . 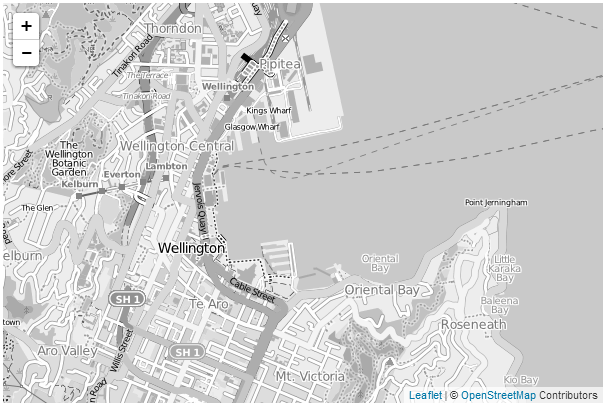 This is variation on the standard tile server in use for Open Street Map but in black and white / grey-scale. The best place to view the detail on the usage policy for Open Street Maps tiles is from their tile usage policy wiki page. The main concern with usage is the load placed on their resources which are finite considering their position as a volunteer run service. So be gentle and when in doubt, check out the wiki. Open Street Map provides open data, licensed under the Open Data Commons Open Database License (ODbL). The cartography in their map tiles is licensed under the Creative Commons Attribution-ShareAlike 2.0 license (CC BY-SA). They require that you use the credit “ © OpenStreetMap contributors” and that the cartography is licensed as CC BY-SA. You may do this by linking to the copyright page athttp://www.openstreetmap.org/copyright. I will post separate examples of the usage of different tile servers as separate posts. Or you can find them all in Leaflet Tips and Tricks. The description above (and heaps of other stuff) is in the Leaflet Tips and Tricks book that can be downloaded for free (or donate if you really want to :-)). They moved. And while they still have the "tiles" tool running, I don't find the "bw-mapnick" anymore. Any ideas where to find it or something similar? Apologies for the extremely late answer to your question. I expect that you have moved on, but I'll try and provide some guidance for anyone else who might read. I had a search about, but couldn't locate an alternative sorry :-(.